This article appeared at the SCAA Chronicle, the publication of the Specialty Coffee Association of America, now the Specialty Coffee Association. Finally, “organic” doesn’t necessarily mean “high quality.” Organic coffee is often grown under a canopy of shade, and shade-grown coffee tends to ripen more slowly. Slower growth may intensify flavors, resulting in a better-tasting cup. This subtlety may not be discernable by the average consumer, and of course any coffee, carelessly harvested or processed, can result in a lousy cup. I’d like to welcome new readers to Coffee & Conservation. I am an ornithologist and coffee lover, and I believe that the simple choice of the coffee we choose to buy has the power to help conserve birds, the ecosystems that sustain them, and provide a stable, comfortable income for farmers. It’s wonderful to have an opportunity to reach audiences, especially those coming from Michigan Blue Magazine and the American Birding Association. I was interviewed for the winter 2016 issue of Michigan Blue for the article “Is coffee for the birds?” (pdf) which covered shade-grown coffee and the connection to birds, and the genesis of Coffee & Conservation. If you are here because the article piqued your curiosity, I hope that reading through this site will introduce you to the issues behind your morning cup and how important it is to purchase sustainably-grown coffee. The American Birding Association is re-launching their Song Bird Coffee line which will now be certified Smithsonian Bird-Friendly. I believe that birders can be especially influential in supporting and advocating for sustainable coffee. I have found many birders are reluctant to change their coffee-buying habits; I hope the information on this site will make a case for change. Where to begin? Quick ways to find more information include the User Guide tab at the top of the page, the Featured Content links at the upper left, and the search box at the top right. Listed below are links of particular interest to get you started. How is coffee grown, and why is it important to birds and other biodiversity? Why is shade coffee specifically important to birds? Know Your Coffee birds! I write short features on birds — those that nest in North America as well as resident tropical birds — that are especially dependent on shade-grown coffee. What do all the certifications mean? Here is my guide to the common coffee certifications, in a nutshell, focusing on their environmental criteria. Why should I pay more for certified or environmentally-friendly coffee? Farmers have many costs related to certifying their farms so that you can enjoy good coffee that protects the environment. If farmers can’t make up those costs, they stop growing coffee organically or under ecological standards. And anyway, it really isn’t that expensive. See for yourself: What does a great cup of coffee cost? Where can I get environmentally-friendly coffee? More retailers of certified Bird-Friendly coffee at the Smithsonian Migratory Bird Center website. Some top tips on how to choose coffee, especially if certifications are not available. Elfin-woods Warbler. Photos by Mike Morel/USFWS under a Creative Commons license. It has been awhile since I have posted an entry in the Know Your Coffee Bird series, which profiles birds that utilize shade coffee farms. This post is about a species that was not on my short list for an upcoming account, but has a very special, recently defined connection to coffee. The Elfin-woods Warbler (Setophaga angelae) is one of over 100 species of warblers found in the New World, and is only found in Puerto Rico. Discovered and described less than 50 years ago, it is named for a unique habitat it favors — elfin woods. High humidity and rainfall, strong winds, and nutrient-poor soils result in the short, often twisted trees (dominated by only a few species) that are characteristic of these forests, found between 750-850 meters. More recently, the warbler has also adapted to lower wet forests at 600-900 meters. 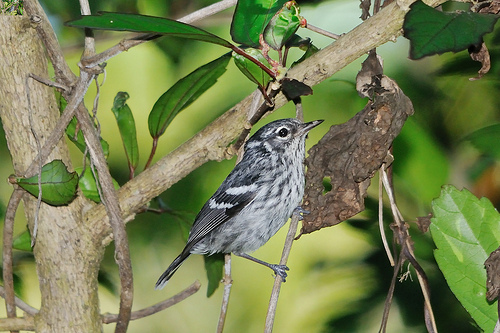 This bird may have eluded discovery for so long due to being very similar in appearance to another species I have profiled as a coffee bird, the Black-and-white Warbler, which nests in North America but winters in Puerto Rico. The Elfin-woods Warbler was likely always rare, and it was proposed for listing under the Endangered Species Act in 1982. Habitat loss and degradation due to development, agriculture, and hurricanes are among the factors that drove population declines in the following decades. The current estimate is fewer than 2000 individuals in two populations: in the El Yunque National Forest in the eastern part of the island, and in Maricao Commonwealth Forest and adjacent private lands in the west. Part of the latter is an Important Bird Area designated by BirdLife International. Earlier this month, after years of languishing as a candidate, the warbler was finally designated as Threatened under the Endangered Species Act. When a species is afforded protected status under the Act, “critical habitat” is designated. These are areas that are essential to conservation and which may require special management efforts. 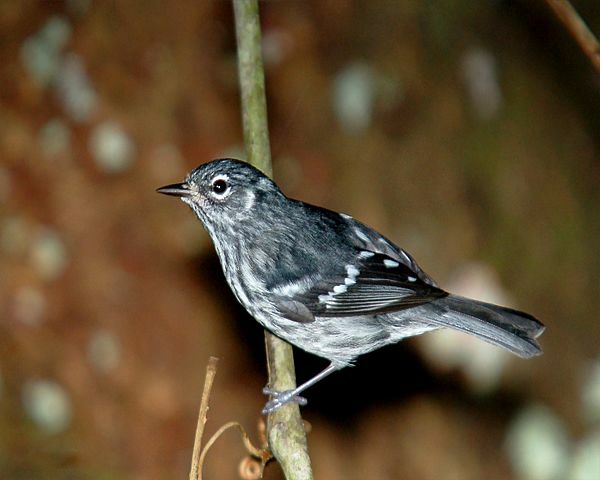 Critical habitat for the Elfin-woods Warbler is largely public land, but does contain private holdings including coffee farms and potential coffee-growing land adjacent to the Maricao Commonwealth Forest. The warblers have been detected in shade coffee plantations, but not in sun coffee farms. Thus, in the critical habitat areas, conversion of shade coffee to sun coffee will be prohibited. Conversely, the planting of shade trees on sun coffee farms is encouraged. Provisions for coffee growers in this area also allow for pruning of shade and coffee trees, but only outside of the nesting season. Herbicides and pesticides may be used, but only during the first two years or so while the coffee and shade trees are becoming established (a time in which the warblers are not likely to use the farm). Previous research has indicated that much of Puerto Rico’s coffee is not grown under shade, but that farmers are willing to convert to shade if they were encouraged to do so by incentives such as being supplied with shade trees to plant. Since 2010, the US Fish and Wildlife Service has been working on habitat restoration initiatives in the Maricao coffee growing area through the Partners for Fish and Wildlife program. This has included technical and financial assistance to landowners to establish and restore shade coffee. The listing of the Elfin-woods Warbler will likely provide more incentive and opportunity for farmers to create and enhance shade coffee, to the benefit of this interesting bird and other biodiversity associated with its habitats. Cafiesencia: Puerto Rican non-profit with many rural community projects, often focusing on coffee-growing communities; projects include assisting landowners with forest management plans in the Maricao area for the benefit of birds, biodiversity, and farmers.